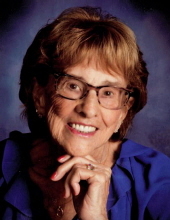 MIDDLETON/MARTINSVILLE/CROSS PLAINS-Dolores Mary Ann (Laufenberg) Simon, age 92, passed away surrounded by her loving family on Wednesday, Jan. 23, 2019, at St. Mary’s Hospital in Madison. Dolores was born July 15, 1926, in the town of Springfield, the daughter of Adolph and Christina (Krantz) Laufenberg. She attended St. Peter’s Catholic School in Ashton. Dolores married the love of her life, John M. “Jack” Simon, on August 5, 1947, at Holy Redeemer Catholic Church in Madison. A Mass of Christian Burial will be held at ST. BERNARD CATHOLIC CHURCH, 7450 University Ave., Middleton, at 11 a.m. on Monday, Jan. 28, 2019, with Fr. Brian Wilk presiding. Burial will be held at St. Martin of Tours Martinsville Cemetery at 2 p.m. Visitation will be held at the church from 3 p.m. until 6 p.m. on Sunday, Jan. 27, 2019, and again at the church from 9 a.m. until the start of the Mass on Monday. In lieu of flowers, memorials may be made in Dolores’ name to St. Bernard Catholic Church. "Email Address" would like to share the life celebration of Dolores M. (Laufenberg) Simon. Click on the "link" to go to share a favorite memory or leave a condolence message for the family.